Well, today is supposed to be a "pool" day, but so far it's rainy and mucky outside. We'll see if it clears up! Why do babies do these kind of things? Food blog, Ally, food blog. Yesterday at the store, if you read yesterday's post, I picked up a bag of broccoli slaw. Shockingly, I've never had this before? I'm thinking I'll put it into a lot of things...I got recommendations for both tacos and stir fry. But, last night I went the traditional slaw route. Mix all ingredients together and put in the fridge to chill, for at least an hour before eating. This will let all the flavors soak together! 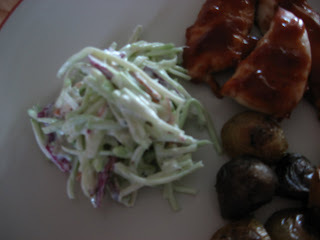 Again, I went the traditional route and did a somewhat BBQ themed dinner - barbecue baked chicken, roasted garlic potatoes and slaw! Later today, I'll be making some things for the farmer's market tomorrow, including a new dip I dreamed up. Literally dreamed up, I woke up thinking about it this morning - Jalapeno Popper Cheese Spread. Oh - and lastly, my sister, mom and sister-in-law are headed to the Windy City of Chi-town for a girls trip in a couple weeks. I think we'll be staying downtown...what eats should we hit up? Your broccoli slaw looks great! I love BBQ themed dinners! I can't wait to hear about the jalapeno dip! OMG - did you just say Jalepeno popper cheese spread!!!!!!!! I will NEED this recipe. Jalepeno poppers and I are BFFs! ahhh I was just in Chicago over the 4th and had a great time. My family lives in the suburbs but we actually spent that weekend right downtown. I highly recommend The Purple Pig which is right on Michigan Ave. It's a great 'small plates' restaurant and wine bar...very fun atmosphere and funky menu! You also can't miss Garrett's popcorn--a Chicago novelty. There are lots of Garrett's stores around town, you should be able to find one no problem. For more "fast food", Portillo's is awesome...LOVE their chopped salad and their chocolate cake shake! Let me know if you want other recs--have a great time! 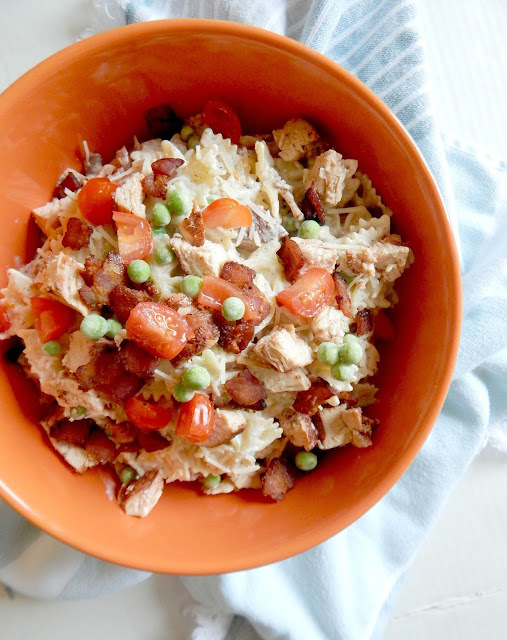 You had me at jalapeno popper cheese spread!! My husband and I went there on one of our wedding anniversaries, and its hands down probably one of the top 3 meals we've ever had together. I want the Jalapeno Popper (I almost typed Pooper) Cheese Spread!!! The slaw looks great and little man below is a doll baby! So cute!!! I'm new here and will be back for sure! BTW, I live in the Chicago area. There are so many great restaurants and about all of them are good. Harry Caray's has great Italian food and they have to try a Chicago-style pizza and Italian beef, dipped! The Chop House is excellent, Gene and Georgetti's is excellent also and my favorite! All in the Loop! 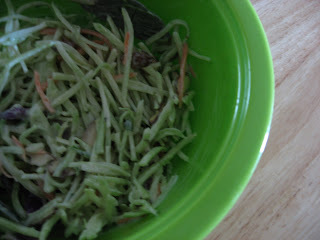 Oh I LOVE broccoli slaw-the stem is the BEST part of broccoli in my humble opinion :) good luck with the pepper dip! I am following you from Angies Recipe blog.